Randy Robertson played a big part in helping Pennsylvania become the 24th state to legalize medical cannabis. We have a lot to thank him for. 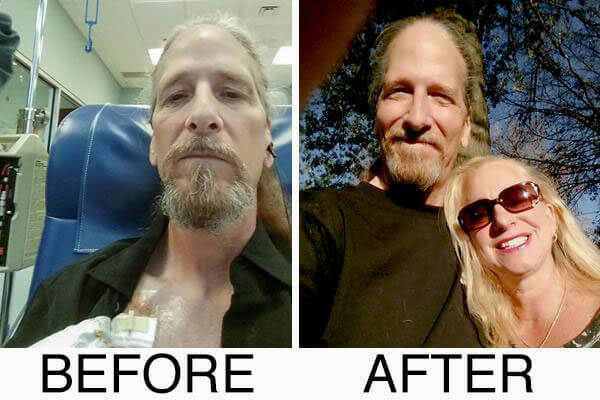 Pennsylvania recently became the 24th state to legalize medical marijuana, thanks in big part to Randy Robertson, a man facing a rare type of cancer that left him with less than a year to live. After using cannabis illegal as a form of treatment, Robertson knew he had to help the legalization movement in PA. Last week, Robertson lost his battle but lived long enough to see medical cannabis legalized in his home state. After being diagnosed with a rare, inoperable cancer, it’s unimaginable to consider what thoughts race through a person’s mind. Certainly, seeking the best form of treatment becomes the most important goal in extending life expectancy, but when any outcome is grim, it might be time to change perspectives. Randy Robertson was featured on many different local news stations, showcasing the important impact medical cannabis can have on individuals. Last October, Robertson was diagnosed with an extremely rare type of bile duct cancer that had already spread to his liver and lungs. Doctors told Robertson he would have less than a year to live. When intense rounds of chemotherapy caused more harm than good, Robertson turned to using illegal cannabis to help ease the symptoms. After finding the relief he was looking for, he knew this miracle medicine could help so many others who were suffering from just as terrible, if not worse, conditions. Robertson spent what little time he had left on this earth fighting to give others legal access to medical cannabis. I’m convinced I wouldn’t be here without it. The chemotherapy was extremely difficult to get through and the cannabis really made that a lot more tolerable for me. Robertson concealed his cannabis use in the beginning, but shortly after realizing the plants’ potential, and with talks of medical cannabis legalization already coming down the wire, he came out as one of the strongest cannabis advocates in Pennsylvania. Local news stations covered stories on the man who illegally used cannabis to battle an aggressive type of cancer, and even risked potential jail time doing so. Before passing, Robertson had the opportunity to stand in the state capitol and watch, as PA Governor Tom Wolf signed legislation legalizing medical cannabis for a variety of qualifying conditions, cancer being among them. His goal had finally been achieved, and Robertson knew the cannabis that helped him could now go on to help many, many more people. Robertson’s wife believes the cannabis was a crucial part extending his life as long as possible. She knows it helped him to stop the use of narcotic prescriptions, which often leave users in a strong, sedated daze. She calls the cannabis he used a “blessing” in enhancing the end of his treatment and his life. Despite being given less than a year, Randy Robertson outlived doctors’ expectations. His family credits this, in large part, to his use of cannabis. He may have lost his battle at the age of 57, but his legacy will remain intact for decades to come, as patients across the state of Pennsylvania now have legal access to medical cannabis because of him. How has cannabis helped to better your life? Let us know on social media or in the comments below.